The net worth of Amazon.com founder Jeff Bezos continues to soar. Amazon founder and chief executive Jeff Bezos. 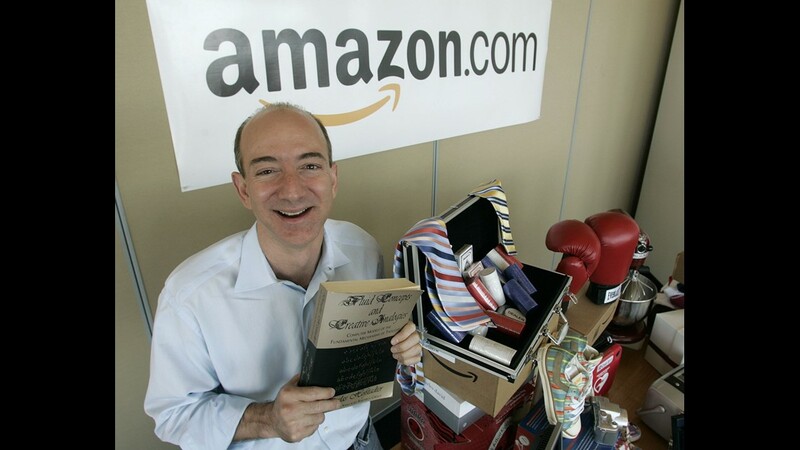 Amazon.com founder and CEO Jeff Bezos holds a copy of "Fluid Concepts and Creative Analogies" by Douglas Hofstadter -- the first book sold online by Amazon.com -- as he poses for photos at the company's headquarters in Seattle on June 17, 2005. Amazon launched at the dawn of the Web as an online bookseller on July 16, 1995. 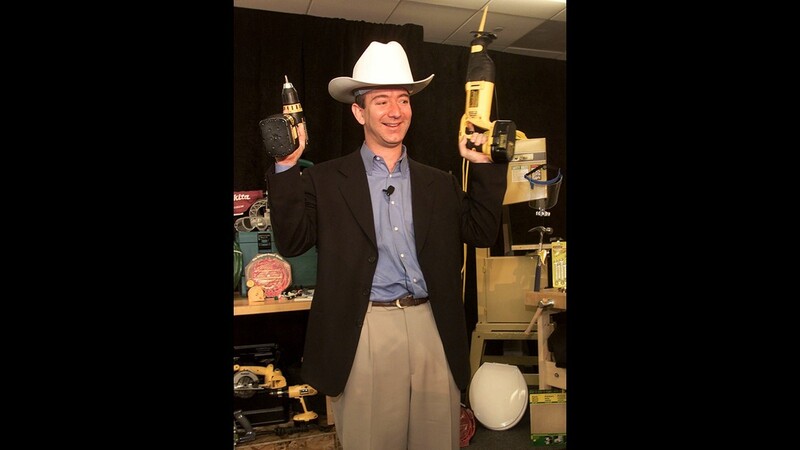 Jeff Bezos, founder and CEO of Amazon, demonstrates a cordless power drill and reciprocating saw as he wears a Western-style hard hat at a New York news conference on Nov. 9, 1999. Amazon added home improvement goods, computer software and a wider array of video games to its Web site in a move by the Internet merchant to build itself into an online superstore. 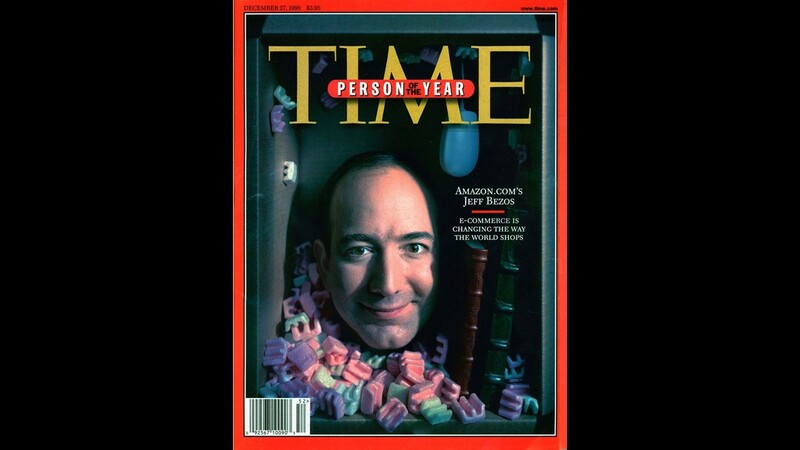 Jeff Bezos, founder and CEO of Amazon.com, Inc., appears on the cover of the December 1999, issue of Time magazine as the magazine's "Person of the Year" for 1999. "There were two great themes of the year, online shopping and dot-com mania, and the minute we thought of Bezos it was obvious that he embodied both" the magazine wrote. 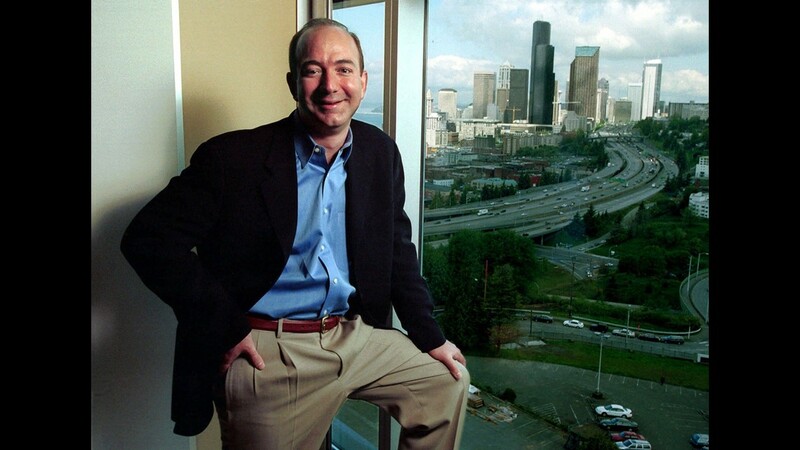 Jeff Bezos, founder and CEO of Amazon.com, is shown during an interview at the online retail company's offices overlooking the Seattle skyline on May 2, 2001. Despite company layoffs and a bruising stock plunge, Bezos said he believed in Amazon more than ever. 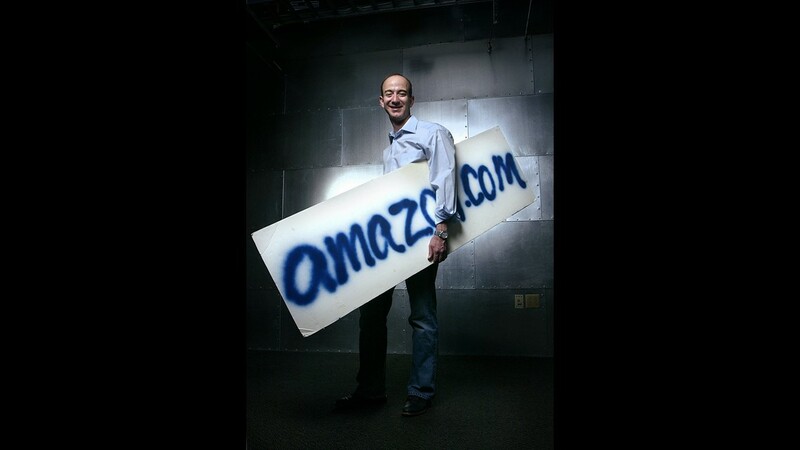 Jeff Bezos, founder, CEO and chairman of Amazon.com, holds the company's first sign, quickly spray-painted prior to an interview with a Japanese television station in 1995, at Amazon's Seattle headquarters on March 11, 2004. 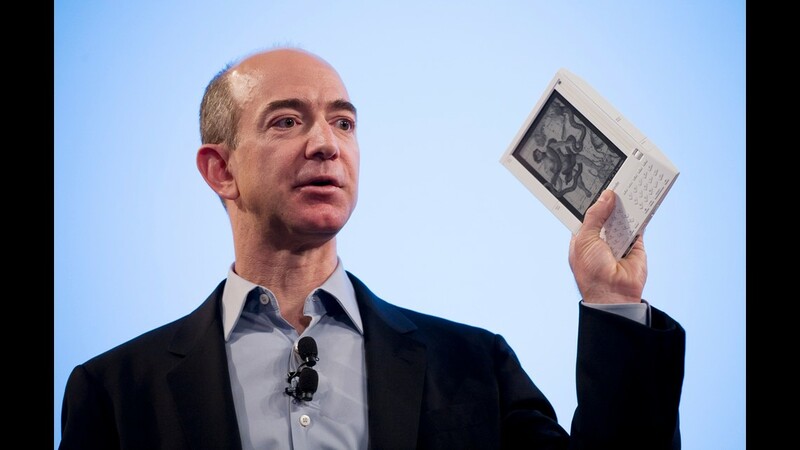 Jeff Bezos, founder and CEO of Amazon.com, introduces the Kindle at a news conference on Nov. 19, 2007 in New York. The $399 electronic book device allowed downloads of more than 90,000 book titles, blogs, magazines and newspapers. 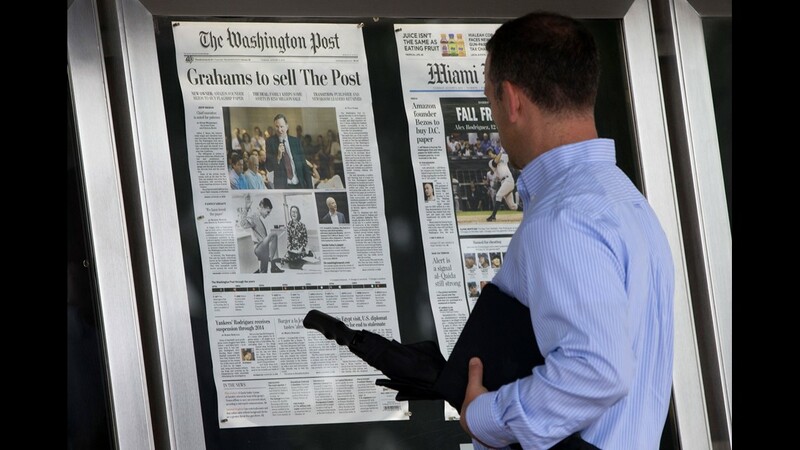 A visitor views the front page of the Washington Post, displayed outside the Newseum in Washington on Aug. 6, 2013, a day after it was announced that Amazon.com founder Jeff Bezos bought the Washington Post for $250 million. This photo released by Amazon on Dec. 1, 2013 shows a flying "octocopter" mini-drone that would be used to fly small packages to consumers. 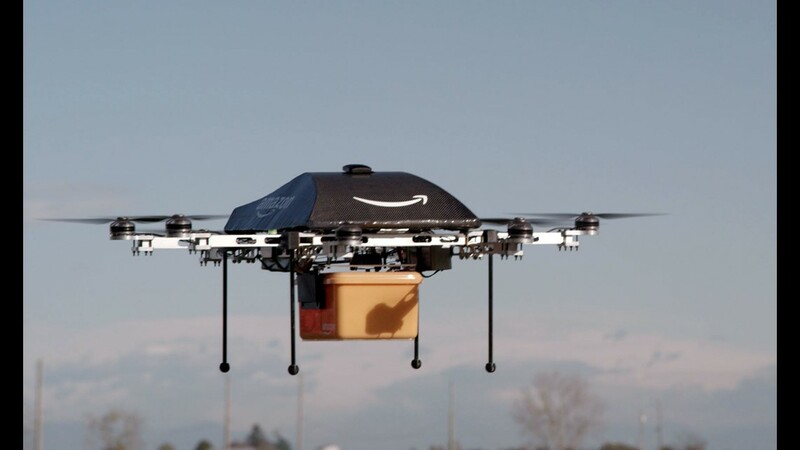 Amazon CEO Jeff Bezos revealed that his company was looking to the future with plans to use mini-drones to deliver small packages. 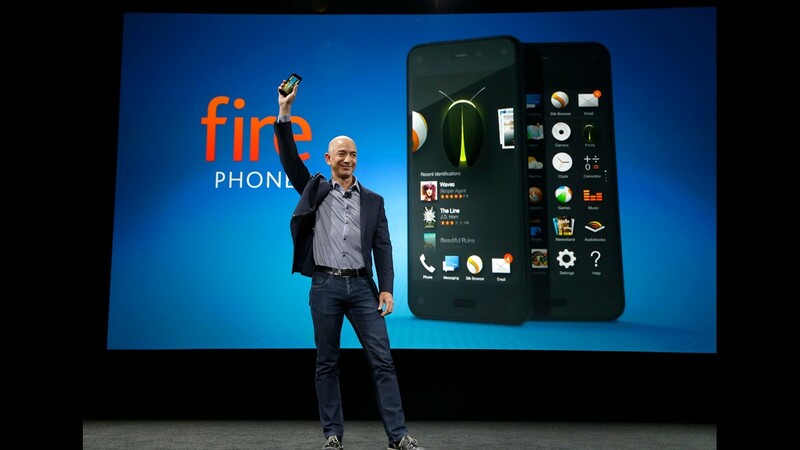 Amazon CEO Jeff Bezos holds up the new Amazon Fire Phone at a launch event June 18, 2014, in Seattle. 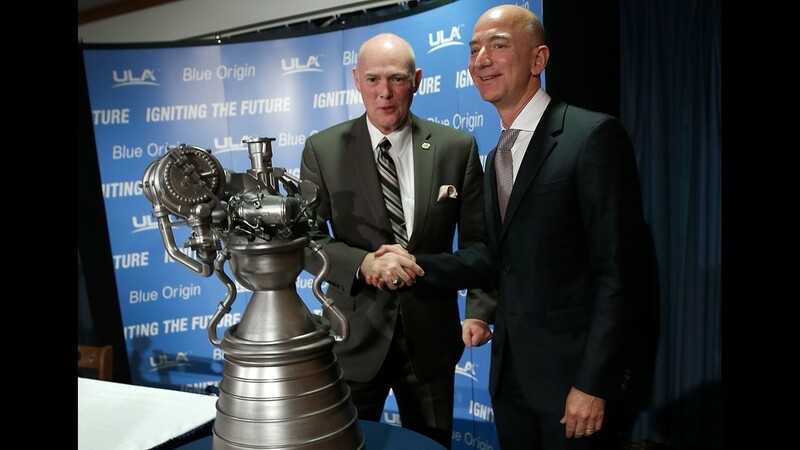 Jeff Bezos, right,, the founder of Blue Origin and Amazon, shake hands next to a model of the new BE-4 rocket engine during a news conference with Tory Bruno, CEO of United Launch Alliance, at the National Press Club on Sept. 17, 2014, in Washington. United Launch Alliance and Blue Origin announced that they have entered into an agreement to jointly fund development of the BE-4 rocket engine. 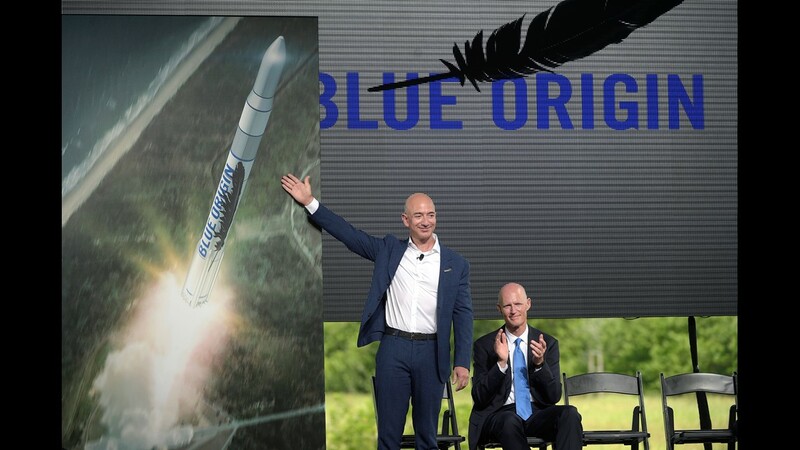 Amazon CEO Jeff Bezos, left, unveils the new Blue Origin rocket, as Florida Gov. Rick Scott applauds, during a news conference at the Cape Canaveral Air Force Station in Florida on Sept. 15, 2015. Bezos announced a $200 million investment to build the rockets and capsules in the state and launch them using the historic Launch Complex 36. 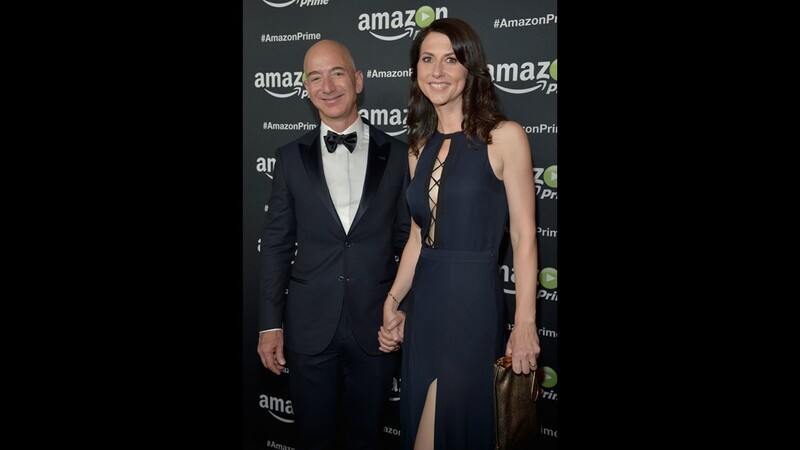 Entrepreneur Jeff Bezos, left, and his wife MacKenzie Bezos attend Amazon Prime's Emmy Celebration on Sept. 20, 2015, in Los Angeles. 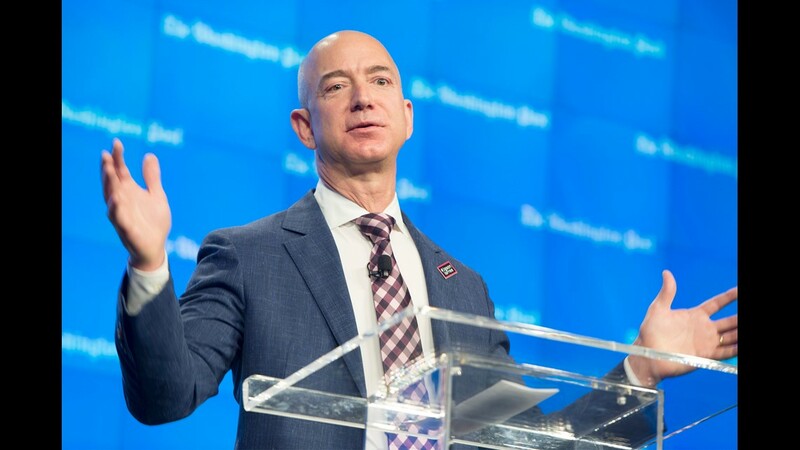 Jeff Bezos, owner of the Washington Post and founder of Amazon, delivers remarks at an event celebrating the new location of "The Washington Post" on Jan. 28, 2016. "Forbes" reports on July 29, 2016 that Jeff Bezos, is the world's third-richest person. 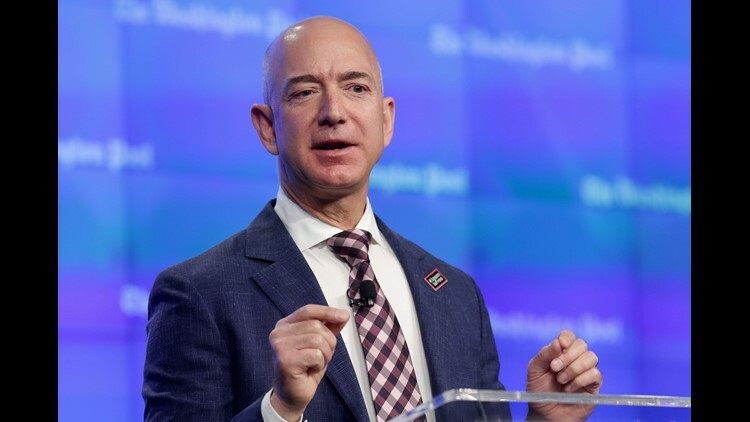 WASHINGTON – Amazon CEO and Washington Post owner Jeff Bezos on Thursday called President Donald Trump's criticism of journalists "dangerous," saying he will consistently stick up for the role of media in democracy. "It is a mistake for any elected official, in my opinion – I don’t think this is a very out-there opinion – to attack media and journalists," he told interviewer David Rubenstein in an on-stage interview at the Economic Club of Washington, D.C.
Trump has repeatedly accused legitimate journalism of being "fake news." He has also baselessly accused Bezos of using his ownership of the Post as a vehicle for lobbying on behalf of Amazon, which he alleges does not pay enough taxes. "I do defend the Post," Bezos said. "I don’t feel the need to defend Amazon." Bezos said that public figures need to get used to bad headlines as a natural part of being in the spotlight. Rubenstein asked Bezos whether he has discussed Bezos' criticism directly with the president. "I’ll keep my conversations with the president to myself," he said. "But, yes, I’ve had a couple of conversations with him." Bezos made the appearance the same day he and his wife, MacKenzie, announced a $2 billion fund to help homeless families and create preschools. He said he would continue to give away money over time and invest in his rocket company, Blue Origin, as a vehicle for colonizing space. Bezos made the appearance in Washington amid speculation that D.C., northern Virginia and southern Maryland are among the leading contenders for Amazon's second headquarters. Seattle-based Amazon has announced that all three areas – which are located within a commuter's drive of the Post and a home Bezos is building – are among 20 regions under consideration for what the company has called HQ2. The second headquarters will eventually have some 50,000 jobs. Bezos declined to provide any hints on the process but said the decision would be made in 2018. "We’ve made tremendous progress," he said. "The team is working hard on it." • Blue Origin has a budget of nearly $1 billion this year. • His title as the world's richest person wasn't a life goal. "I can assure you I have never sought that title. It was fine being the second wealthiest person in the world. That worked fine," he said. • He's a customer of Amazon, and the company doesn't always get his order right. "Yeah, I have problems sometimes," he said. When that happens, he said he tries to address the root of the problem. 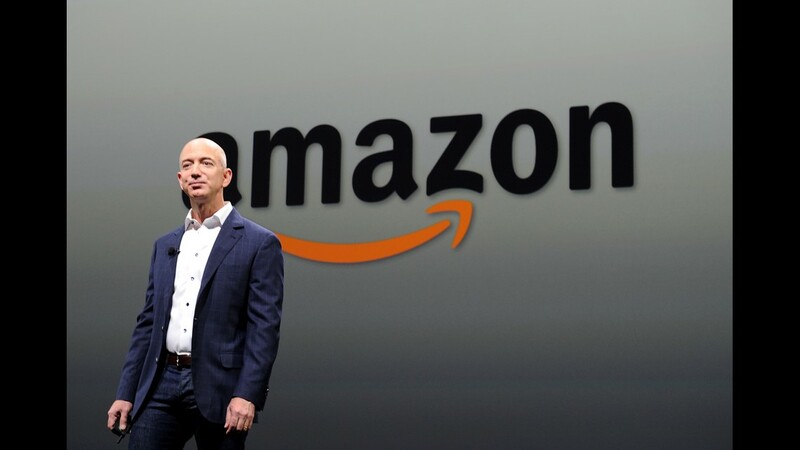 • Amazon can handle regulatory scrutiny that many speculate will come as the company grows. But he also cautioned against "vilifying" big companies, saying they can accomplish much. "All big institutions of any kind are going to be and should be examined, scrutinized, inspected," he said. "This is just normal. It's actually healthy. It's good. We want to live in a society where people are worried about big institutions." Amazon, he said, can deal with it. "We are so inventive that whatever regulations are promulgated, however it works, that will not stop us from serving customers," he said. Follow USA TODAY reporter Nathan Bomey on Twitter, @NathanBomey.